Possessing irresistible Craftsman charm, this cozy home boasts a unique exterior and family-efficient interior. A large stone portico greets visitors through the front entry and into the home's open foyer. A single column defines the entry to the foyer, dining and great rooms. The large great room also includes a cathedral ceiling, built-in bookshelves, fireplace and porch access. The adjacent kitchen spills into the breakfast area and includes a large pantry. The generous garage features ample storage space and enters the home near two secondary bedrooms that share a bath. 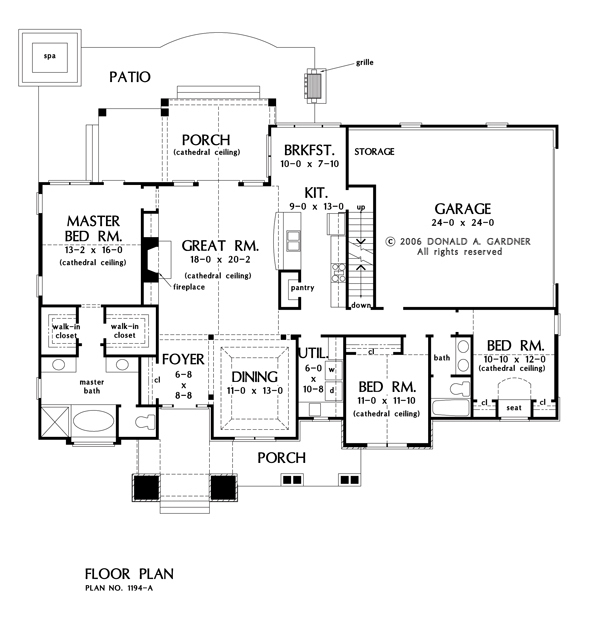 On the other side of the home, the master suite accesses the rear porch, and consists of a luxurious master bath with his-and-her vanities, as well as closets. 1st Floor: 1920 Sq. Ft. 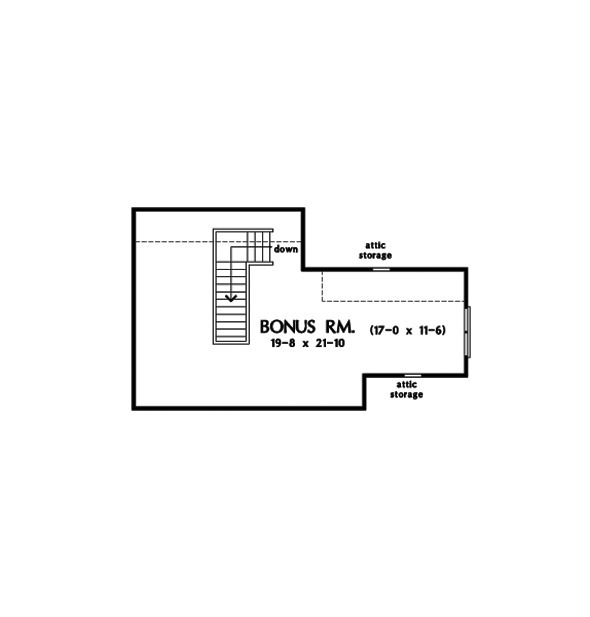 Bonus Room: 692 Sq. 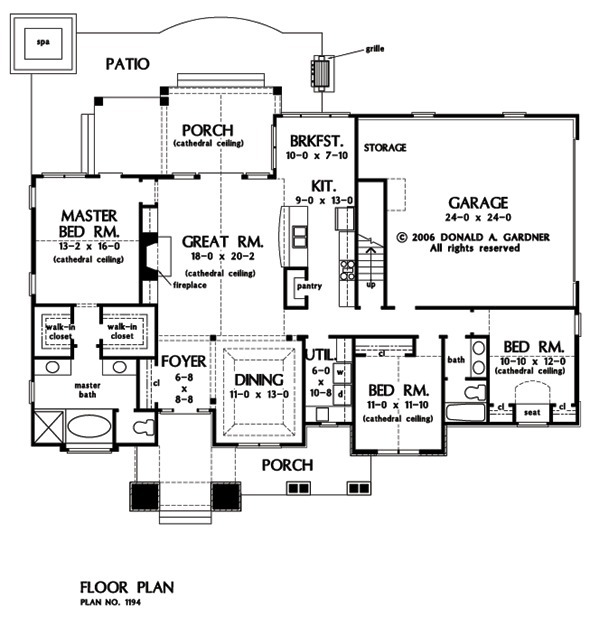 Ft.
House Dimensions: 69' 4" x 53' 4"
Great Room: 18' 0" x 20' 2"
Bedroom #2 (Cathedral): 11' 0" x 11' 10" x 15' 0"
Bedroom #3 : 10' 10" x 12' 0" x 14' 6"
Bonus Room (Vaulted): 19' 8" x 21' 10" x 9' 0"
Deck / Patio : 36' 10" x 8' 0" x 0' 0"
Foyer (Flat): 6' 8" x 8' 8" x 11' 9"
Garage Storage : 3' 8" x 7' 10" x 0' 0"
Great Room (Cathedral): 18' 0" x 20' 2" x 16' 8"
Kitchen : 6' 0" x 13' 0" x 9' 0"
Master Bedroom (Cathedral): 13' 2" x 16' 0" x 16' 11"
Porch - Rear (Cathedral): 22' 10" x 10' 0" x 12' 2"
Porch - Front : 29' 6" x 6' 0" x 11' 9"